There are a variety of ways to show skill on the cricket field. Modern spectators tend to prefer the emphatic ways of fiery fast bowlers, firmly struck boundaries and feisty fielding and are far less likely romanticised by an old-fashioned scrap. Watching Zimbabwe at work may force them into a rethink. The No.9 ranked Test team are held back by a lot of things including fixtures, finances and finely-tuned skills but they have learnt how to work within those limitations to push teams rated much higher than them as far as they can. What they lack in prowess they may make up for with pluckiness, a quality that has the ability to charm even the cold-hearted. That was evident on the first day when they stopped themselves from unravelling against a bowling attack whose reputation intimidates long before their actions do and emphasised on the second day with a bowling performance built on patience. Zimbabwe's pack does not have out and out quicks or mystery spinners so they know they are unlikely to be able to blast teams out. They have to bore them out, and they're happy to do that. That is why Tinashe Panyangara and Tendai Chatara adopt the Vernon Philander approach to discipline. They both bowl a good length outside offstump over and over and over again. A significant percentage of their deliveries can be watched as they go through to the wicketkeeper Richmond Mutumbami. They don't make the batsman play nearly as much as they should and as a result they do not concede many runs. Between them, Panyangara and Chatara bowled 31 overs and conceded just 35 runs. Their message to the South African batsman was clear: if you want runs off us, you will have to come and get them and if you don't want to, we will wait until you change your mind and when you do, maybe we'll get you out. The third seamer, debutant Donald Tiripano, is still being schooled in those ways but he was the first to benefit from it when Dean Elgar chased one he would have left alone and was caught behind. Elgar had faced 146 balls for his 61 and the frustration mounted. That's what Zimbabwe were banking on and it gave them three of the four wickets that fell. The lines and lengths Zimbabwe's seamers offered and the surface they offered them on - a dry, slow pitch - tested will rather than willow, which is how Zimbabwe could claim some moral victories. Elgar admitted it took only a small lapse in concentration for Zimbabwe to break through. "I went out of my bubble a little bit. I had a bit of a brain fart and all you need is that one ball," Elgar said. "They are very good bowlers in their conditions. The seamers are very patient. They stuck to the game plan well and are difficult to get away. They have no Dale Steyn, whose pace actually helps, but getting scoring opportunities is quite tough. They bowled well. We are lucky not to be more wickets down." South Africa's own laboured approach did not help them move the game forward but, like they said of the SSC two weeks ago, they were batting with brakes on because of the surface. "It's a very subcontinent-like wicket," Elgar said. "We felt like we were back in Sri Lanka." South Africa's focus on sluggish surfaces like this one is to spend as much time on it as possible and once again, the clock is on their side. After bowling Zimbabwe out early on the second morning, South Africa had the best part of four days to apply their strategy to win this match, which is to bat once, however slowly and leave enough time to bowl Zimbabwe out again. "Any runs ahead of their first-innings total is key for us. We've got to try and extend as much as possible tomorrow, even if it's done slowly. We have to try and bat big," Elgar said. Even if South Africa continue to score slowly, Zimbabwe will look to continue to bowl with discipline and eventually make some inroads. "Our plan is to keep it tight and do the basics right. 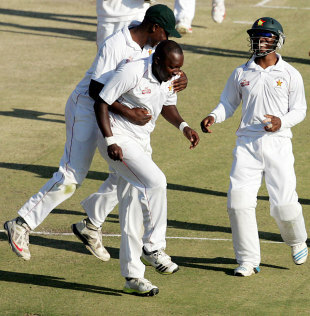 If we can get two or three quick wickets we'd be happy," John Nyumbu, the offspinner said. Nyumbu expects it to become "quite a bit more difficult" to score runs as the game goes on and although he did not say it, Zimbabwe will require a massive effort in their second innings to push for an unlikely win. They will not even tease themselves with that thought. What's evident is that they are making the best use of their skills to ensure they are still in the game and making statements about it, however subtle those statements are.